I’m so fancy! You already know! Remember my name, it’s bout to blooooooow! It looks like Iggy Azalea has found some booty shorts, but we’re still trying to get the girl some pants! Sorry about that, folks! I’m just jammin’ out to Amethyst Amelia Kelly (aka Iggy Azalea), who has brought us some ridiculous traffic this week after our post 10 days ago. It turns out I’m not the only one fond of the Mullumbimby, New South Wales, Australia native. Everyone’s favorite Hip Hop correspondent Kerbey has kept her ear to the underground and brings us the stunning news that Iggy has become the first artist since the Beatles in 1964(!!!!) to have their first two singles occupy the 1 and 2 positions simultaneously on the Billboard Hot 100. That’s a pretty remarkable feat for the 23-year-old chanteuse. I’m sure she hates being called a chanteuse. Sorry Iggy! Mark – asking me to have a clue about anything is an awful idea… you should know that by now! However, I’m sure our insightful fans have an idea or two. So let’s open it up to the polls! Roughned’s shirt should really read “Perfect Name National”! In other baseball news, greenhorn baseball correspondent me (Dave) wants to let you know that Torii Hunter had no idea how to react to an Eephus pitch thrown by Yu Darvish last week. You can find a clip of Torii’s good natured response here. We close things out with two delightful pieces of boxing news. 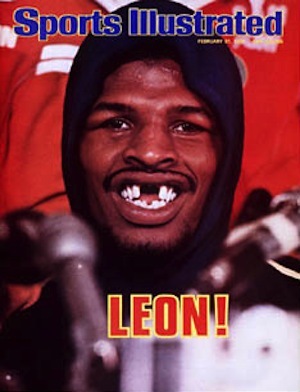 OK fine, that’s Leon Spinks’ Sports Illustrated cover, but it’s impossible to find a good picture of Herbertine Walker! First, Mark informs us that McWilliams Arroyo (who we covered with his brother McJoe Arroyo four months ago) will be appearing on a fight card June 19 on Fox Sports 1. Everyone set your antennas and mark your Rolodex calendar, or whatever it is that cool kids are doing these days when not listening to Iggy Azalea. Second, Dave was reading a fascinating article by former manager Charles Farrell on why he fixed fights, and stumbled upon the name Herbertine Walker, who was the aunt of arguably the greatest middleweight ever, Marvelous Marvin Hagler. (For those who were wondering, I’d put Carlos Monzon, Harry Greb, and Bernard Hopkins on Hagler’s level as the four greatest of all time). The article is very well-written, and worth checking out if you have an interest in the Sweet Science and its history. This entry was posted in Funny Names In The News, Uncategorized and tagged entertainment, funny names, humor, humour, iggy azalea, sports. Bookmark the permalink. When Izzy (my favorite overpriced grapefruit soda) finds some pants and her name is done blowing in another decade, I’m sure she’ll settle down and start calling herself Amy Kelly, like the good Lord intended. 50 yrs ago, the Beatles had the top 5 positions on the charts. Surely no one could ever do THAT again. But 2 is quite a feat, especially for a young whippersnapping chanteuse. In keeping with my hip-hoppiness (oops, just lost my street cred), this post has reminded me of the old MC Lyte song, “Ruff Neck.” Perhaps MC can do a remix version of “Ruff Ned, gotta get a Ruff Ned.” Then he could get a cologne deal as well and play this song in the commercial? I love the idea of Izzy as an overpriced grapefruit soda! You keep making me super happy that we brought you on board! I never even thought of calling her Amy Kelly, but that is probably what they called her in grade school. Good job on “whippersnapping.” My go-to “crotchety old person” word is “newfangled”, but I’ll have to add whippersnapping to my arsenal. I’ll have to listen to that MC Lyte song – the fact that you mentioned it means you still have your cred! Arto and I need you on our trivia team, Murderers Row – we have won three consecutive weeks, but we always struggle on questions about shows from the WKRP in Cincinnati era. And yes, there is a Haggis… film director Paul Haggis! Enjoy your Friday! Mine is sure getting off to a nice start! I knew it! Paul Haggis! So what you’re saying is you need a token coot? That’s what I’m hearing. A token coot to pull out all the useless celeb trivia I’ve been carrying around since my childhood diet of The Enquirer, The Examiner, and The Globe (or “rag mags,” as they are called). Does this trivia team sit at a bar with a newfangled pressy button thing and a pint of ale and compete? Haha, we do sit at a bar with a pint of ale, but no newfangled pressy button. Basically there’s a host who reads a question, then plays a song. During that song, each team discusses the question, writes down an answer on a sheet and wagers a certain number of points. It’s good clean fun! Usually there are about 8-10 teams and it’s always awesome when we get one of the top 2 points because they give prizes. No, no. I deplore politically correct or any fake job title that masks the truth, like Custodial Engineer. Just give me an adhesive nametag and a Sharpie and I can own Token Coot. I’ll even bring a cane and maybe do a little Singin’ in the Rain at intermission. Haha, sounds good, Token Coot! Well, I do have a lot of trivia in my head. And I am a coot, so he had no choice. did you threaten him with your cane? I WAS JUST THINKING ABOUT A CANE!! What is it with you and Arto and this FNitN thing? Knocking um out of the park, every time. Congratulations on that fabulous viewer spike Dave. Why can’t I get that for Kyary Pamyu Pamyu? Hey, in that picture, Iggy’s finally starting to look pretty hot. I think it’s that demure, playful little tee hee Marilyn Monroe scrunch that does it. FNITN is a fun format. We basically accumulate links in our draft during the week, and then get to riff on them each Thursday. It’s like rapid-fire funny names blogging. That spike is something that just happens – usually when we tune in to some current event or trending topic – and it has been fun to ride it the few times it has happened. Hopefully we can get Kyary Pamyu Pamyu to become a trending topic one of these days! 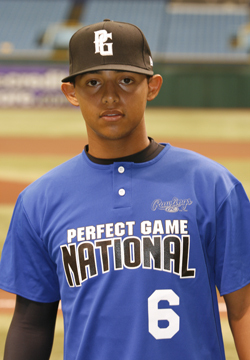 roughned odor, is so often confused with toughted voter. (he was involved in that recent political strong arming scandal i believe), thank you for setting the record straight. Roughnedding can cause strong Odors? I don’t know man, that’s just too weird. Well, not too weird. Just the right amount. I think Roughned rhymes with doughnut. By the way, the correct answer to the poll is “None of the above.” It’s pronounced ROOG-ned. Is that true? If so, how did you find it out? oh boy, how do I miss these parties? Hoping to show up late. Especially enjoyed the comments, though Dave you do continue to amaze and dazzle with all them fancy words and metaphors and bits of wordplay, etc. 😀 I like that you are reading “fascinating articles” and agree with Kerbey that there is plenty of meat on this chicken wing.